“Racoonamatata” is a cafe in central Busan, in the old part of the city where you can barely pass along the narrow streets with your big Korean car, and parking space is scarce. It self advertises as “Coffee & Dessert. Play with racoon”, and that’s a very fair promise of your upcoming experience. Everything inside, everything you can buy at least, is racoon-branded. Smoothie cups, coffee mugs, cookies. The prices are a little bit higher than in usual coffee shops with no furry animation, at a very fair level. Once you go through the instructions, you are allowed into the special part of the cafe where the racoons rock and roll (the three which started the cafe and two new comers, in a special adaptation section). With visitors bringing special food packs available to purchase at the cafe, life is a paradise for them here, and you don’t even question that. Just look at them. Obviously, we were very happy, too. I can’t stand zoos and other places where animals are kept sad and captive (and I don’t go there), but here the narrative was very different. The racoons are totally used to people (even too much, jumping around you on their rear feet asking for food, when in the mood to have some more. Or passing out in the most peaceful sleep just next to you). So you can pet them, hug them and play with them, at a modest risks of getting some unintentional scratches in a process. The cafe gives out blankets to wrap around yourself, too. Drinking reservoir at the Racoon Cafe in Busan, South Korea. The cafe is very well built for the animals. Doors with double protection so that the kids don’t let the animals out by mistake, lots of climbing and playing surfaces, water available 24/7 in special tubes, – if racoons are familiar with the notion of paradise, that would be it. …and already a social media star! Aren’t they great? Boosted my mood up for months to ago. 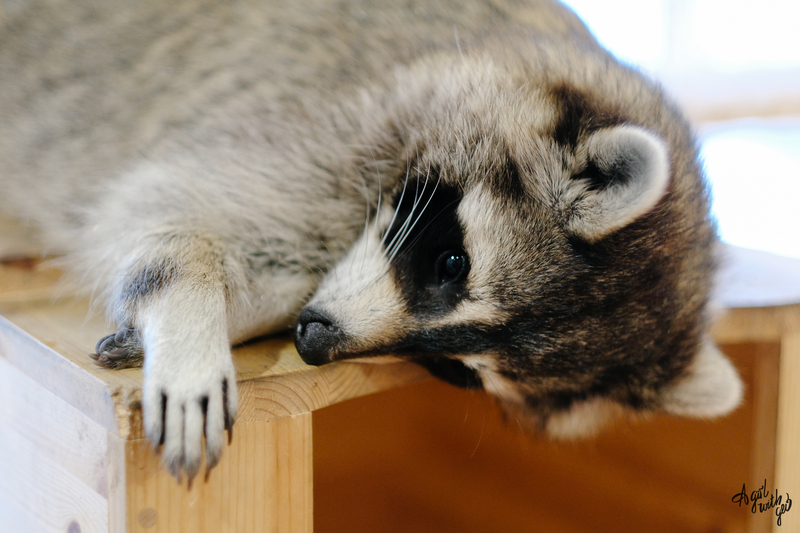 These racoons are adorable – a visit to that cafe would boost my mood for months to come too!